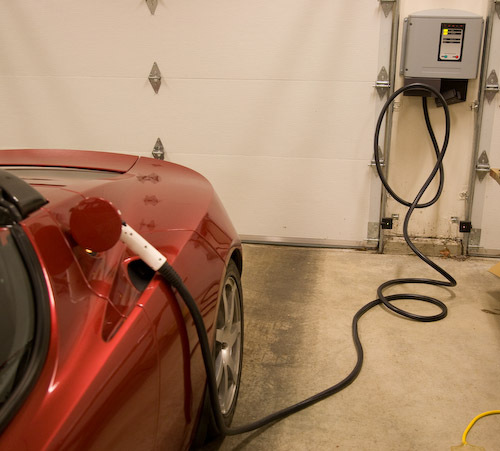 Cathy and I, with help from Dave Denhart and many others in the Tesla and broader EV communities, have converted our 2008 Roadster and Tesla High Power Wall Connector to use the new industry standard J1772 inlet and plug. 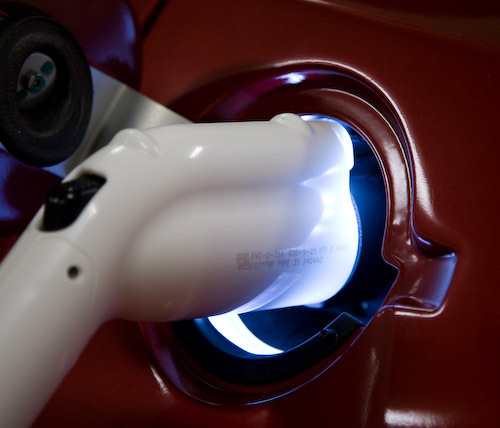 This will allow us to charge without an adapter at the tens of thousands of Level 2 charging stations that will be installed in the US by the end of 2011. What we have is functional and completely reversible, but not ideal; we view this as a version 0.9 conversion. As there are very few J1772 charging stations currently installed, and the numbers probably won't take off until late spring or early summer, we have time to develop a better solution before it actually becomes compelling for Tesla owners to convert in significant numbers. I'm sure Tesla Motors could do a much better job of creating an integrated solution and I would prefer that to having the owner community develop a conversion solution. We've hear rumors that Tesla is developing an adapter, but are still waiting for official word on what, if any, J1772 solution they will provide. 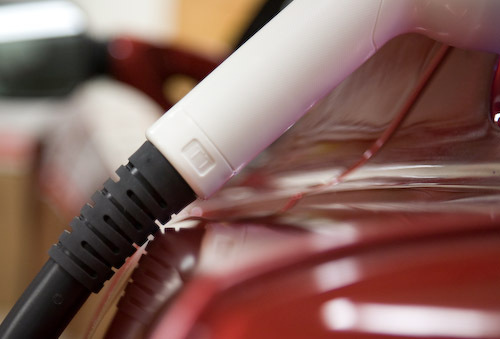 While an adapter would give us a way to charge, we have heard from many owners who would prefer to convert their vehicles and charging equipment to the industry standard rather than leave an expensive adapter vulnerable to theft while charging. 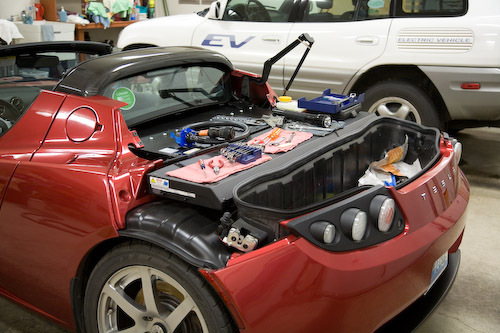 Our effort started last summer when Cathy and I began working with Dave to figure out what it would take to build an adapter that would let a Tesla Roadster charge from the Level 2 J1772 charging stations. We discovered that SAE adopted Tesla's extension to the older J1772 communications standard, so a simple pass-through connector that converts Tesla's charge inlet to the J1772 inlet will allow charging to occur, although there is an issue, which is explained below. Once we understood the protocol, Cathy and I built and tested a pass-through adapter. When I let the Tesla owner community know about our adapter in mid-September, I wasn't surprised to hear that lots of owners were thinking about those thousands of chargers, but I was surprised how nearly all who expressed an opinion agreed with us that the right way to do this was just to convert the Roadster to use the J1772 inlet. From what I'm hearing from new and prospective owners, it seems to me that many potential Roadster customers are put off by the Tesla plug and this is probably already becoming a barrier to sales. In the absence of any word from Tesla Motors about a J1772 upgrade path, we've been slowly working toward doing a conversion ourselves. A few weeks ago, we finally obtained an ITT Canon 75A UL-approved inlet and plug pair from Clipper Creek. 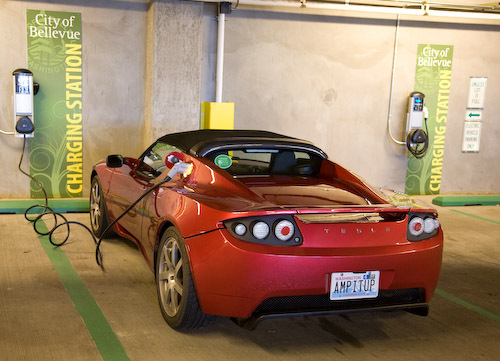 The plug cord is intended as a replacement cable for Clipper Creek's model CS-100, and carries the same power and signal wires as the TS-70 aka Tesla's High Power Wall Connector (HPWC, formerly the HPC). Clipper Creek also sells a holster for the J1772 plug that can be used to replace the holster for the Tesla plug. With the necessary hardware in hand, we starting tackling the engineering challenges in getting the inlet mounted inside the Roadster's charge port: there's limited space to work with and the Roadster wasn't designed with the shape of the J1772 plug in mind, so getting the plug and cord to clear the body is tricky. 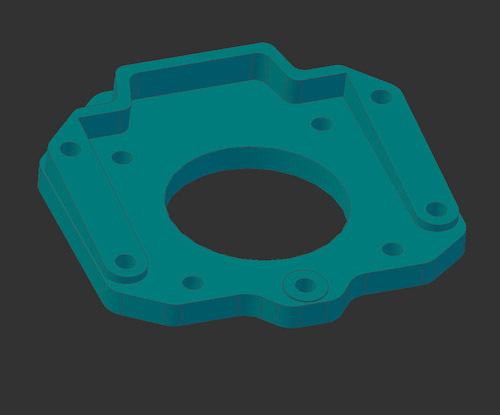 It took a bunch of measuring, brainstorming, numerous experiments, a couple of laser-cut bracket prototypes, some Dremel work on the inlet cup, and then an adapter designed in CAD and printed on a 3D printer to get something functional. This is what the back of the upgraded inlet port looks like. The blue piece is the mounting plate Cathy designed in CAD and we fabricated on a RepRap 3D printer at Metrix Create:Space. Charging from our HPWC, now converted to J1772. The top of the inlet tilts back to angle the J1772 cord up. This works pretty well for the ITT Canon cord with enough clearance at the top of the port that it's easy to slide the plug in and engage the lock, easier than plugging in the Tesla connector in fact. The rubber strain relief on the cord barely rests on the body, plus our Roadster has the paint guard protection there, so I'm not worried about that minor contact damaging the paint. It's not quite as nice with the plug and cord used by the ChargePoint Coulomb chargers, but I think it's OK for use on the occasional road trip. In addition to the cable clearance issue, there's another concern with our v0.9 conversion strategy that has to do with the largest difference between the Tesla and J1772 communication protocols. 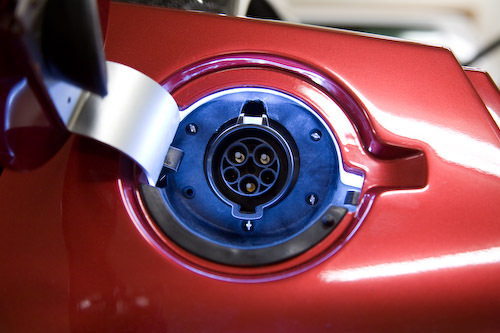 The Tesla plug uses four contacts: two for power, one for ground and one for the pilot signal. The pilot signal is a low-voltage communications protocol that allows the charging equipment to tell the car the maximum amperage supported and allows the car to ask for the power to be turned on and off. The pilot signal is not connected to the car until the plug is connected and the locking switch is engaged. This switch plays a second role: if the driver tries to remove the plug in the middle of a charge, sliding the switch back interrupts the pilot signal which tells the car to stop charging. This happens very quickly so that the driver cannot get the plug untwisted and removed to break the electrical contacts while current is still flowing. It's important to prevent this because doing so can cause arcing, which would damage the contacts. Instead of interrupting the pilot signal, J1772 uses a fifth wire for this purpose. Like the Tesla plug, the locking mechanism on the J1772 plug makes the proximity connection, so that when the driver wants to remove the plug and slides the lock it interrupts the proximity connection, thus telling a J1772 car to stop charging immediately (within a tenth of a second). Unfortunately, the locking switch on the J1772 plug doesn't interrupt the pilot signal. With our v0.9 conversion (or a simple pass-through adapter), the driver can unlock the J1772 plug without the car knowing, and then pull the plug while power is flowing. Cathy and I need to make sure we don't do that. To solve this issue, we need to design a circuit that watches the proximity pin and interrupts the pilot signal when the J1772 plug is unlocked. I don't expect this to be difficult, but we haven't done it yet. 1) Hope that Tesla Motors provides an official conversion solution before it matters to most owners, thus saving us the remaining steps. 2) Design a circuit to monitor the proximity pin and disconnect the pilot signal when the J1772 plug is unlocked. 3) Test with other J1772 plugs and possibly work on a better solution for cable clearance over the body panel. 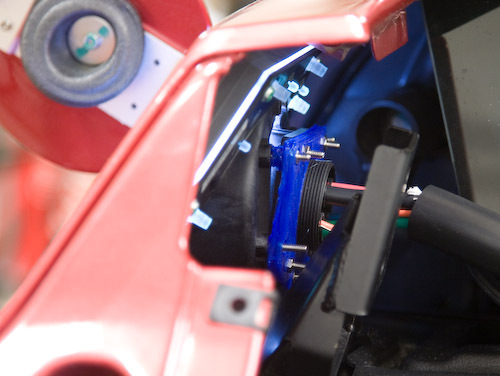 4) The 2010 and later Roadsters have the inlet cable assembly connecting to the PEM in a different location. There may also be other differences. We haven't looked into it yet and don't know if it will be more or less difficult to convert than the 2008 Roadsters. 5) Before recommending an unofficial conversion to other owners, we'll need to find out how this will impact our warranty. Tesla Motors has been cooperative with our efforts: they sold our group an inlet cable assembly so that we could do the conversion reversibly. 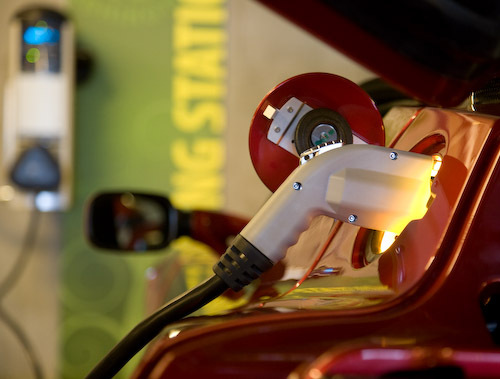 We hope they will continue to be supportive rather than forcing us to wait until our warranties expire before being able to effortlessly access standard J1772 public charging stations.